Copyright © 2010–2013 by Fontlab Ltd.
TransType (short: TrT) is a build machine for fonts. With the new TransType 4, you can convert virtually any font format into other font formats. You can also customize the menu naming and grouping within a font family and apply some visual effects to fonts through filters. TransType had its start in the days of the “font wars” — when the manufacturers of operating systems were battling it out over font formats. 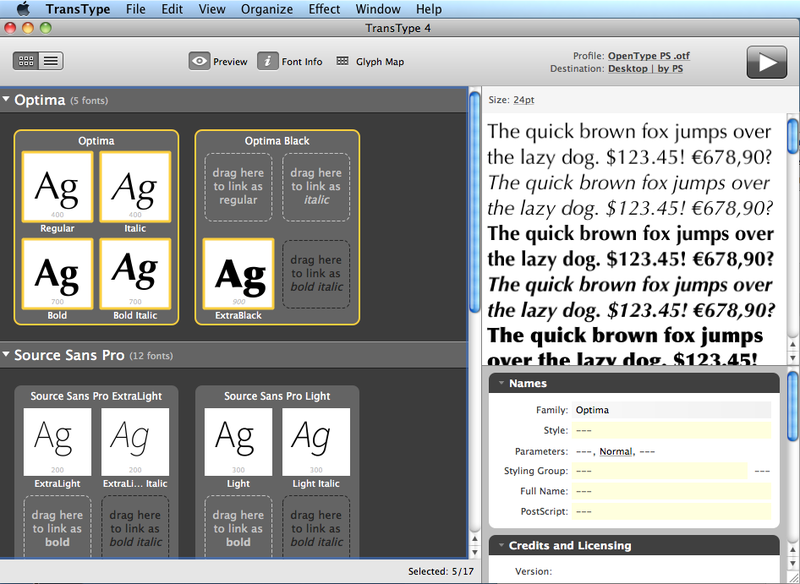 Anyone who worked with fonts needed TransType’s quick and easy conversions between the different formats and platforms. Since then, however, OpenType has established itself as the font format of choice on desktop computers. But we have new font formats which are used on the web (WOFF, EOT, SVG), and by font developers (UFO, VFB), so the need for conversion tools is just as strong. It still does matter whether the OpenType font exists in the PostScript or in the TrueType flavor (OTF or TTF). Also, a number of legacy PostScript Type 1 fonts still exists, which makes it difficult to move documents between Mac OS X and Windows. TransType 4 supports all these formats (new and old), and makes font conversion between them easier than ever before. One of the greatest hassles of converting fonts between platforms has always been the incompatible font family structures and naming systems on different operating systems. As a result of this, fonts have about a dozen different naming fields and settings which control how they appear in the applications’ font menus. Making sure that these fields follow the various specs and guidelines set up by OS and app vendors, and that they’re consistent within a font family, has always been a nightmare for font vendors, and especially for font hobbyists and beginner type designers. TransType 4 is the first application on the market that virtually eliminates this problem by introducing a revolutionary, intuitive visual approach to font family management. All you need to do is tell TransType to optimize the styling, and all fonts will be neatly arranged within the family. To make corrections, drag-and-drop a few font thumbnails, or click-and-edit one or two text fields — and your fonts are guaranteed to work cross-platform. The time required to turn any type design project (in VFB or UFO format) or any existing desktop fonts into a font family that works across all operating systems and all web browsers — with TransType 4, is literally reduced from hours to minutes. But fonts are not just about work and hassle — they’re primarily about fun and creativity. So TransType 4 includes a number of sophisticated filters, which can be used to change the font’s appearance. Some are purely functional. The Blend filter allows the user to take any two fonts, and create a new font that looks like a bit of both — perfect for making a Medium weight in a family where the Regular is too thin, and the Bold is too dark. The Tracking filter simply adds or removes space between characters and ‘hardwires’ the changes into a new font. Other filters are much more experimental — Blur or Distort will add a grunge look to the most ‘corporate’ sans serif, while Round will add warmth to the coolest ‘techno’ letterform by softening its hard corners. The Filters are not a replacement for a professional type designer’s work, but they’re fun to use. For font foundries or type designers who enjoy the creative process of designing a typeface, and want to produce OpenType fonts or webfonts, but do not want to be bothered with font format technicalities — TransType 4 is a perfect companion for their font editor, whether they’re using FontLab Studio, Fontographer, TypeTool, or one of the editors that support the UFO format. For professional graphic designers and art directors — TransType 4 can help them experiment with their typeface collection, customize a font’s weight, adjust the slant angle or permanently modify the font’s tracking. For regular font users — if they’re troubled with platform and application incompatibilities, TransType 4 can fix these problems; and if they’re just bored with the fonts they have, they can try making some new ones with more pizazz. Please note that many font foundries do not allow modification of their original font files, or distribution of such modified fonts, so users should consult the font’s End-User License Agreement before using it in TransType.